FREDDIE HAS BEEN FOUND ! 10 days after she went missing, and 5/6 miles away from home, Freddie was found and is now reunited with her brother and owners. Many, many heartfelt thanks to everyone who spread the word and boosted the signal! Freddie went missing from the Auchendoon Road area of Newton Stewart on Friday 17th May 2013. 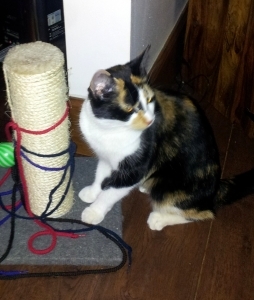 She is an 11 month old tortie and white cat, quite small and is neutered. This entry was posted in Cats Lost. Bookmark the permalink.